See that tiny green pinprick of light? 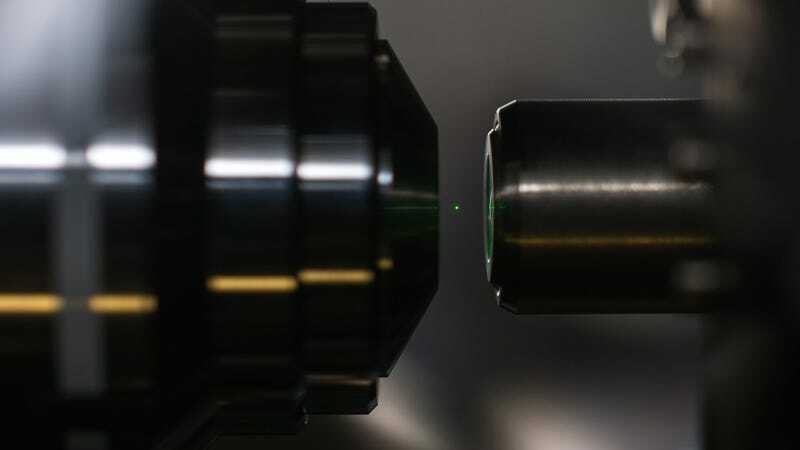 That's a speck of diamond dust trapped in the grip of a laser beam. And with its help, researchers hope to better understand the border-world between macro and quantum physics. The team, led by University of Rochester assistant professor of optics, Nick Vamivakas, has submitted a paper for publication to the journal Optics Letters describing how they were able to successfully capture, levitate, and hold diamond nanoparticles as small as 100 nm indefinitely as well as incite the crystals to emit photons at varying wavelengths. The light emitted by the nanodiamonds is due to photoluminescence. The defects inside the nanodiamonds absorb photons from the second laser – not the one that is trapping the diamonds – which excites the system and changes the spin. The system then relaxes and other photons are emitted. This process is also known as optical pumping. Getting the diamonds into position was no easy feat. The team had to spray an aerosolized nanodiamond dust solution into a 10-inch cubic box housing the lasers. Some of the nanodiamonds are attracted to the beam and will eventually become trapped though as graduate student Levi Neukirch explains: "it takes a couple of squirts and in a few minutes we have a trapped nanodiamond; other times I can be here for half an hour before any diamond gets caught. Once a diamond wanders into the trap we can hold it for hours."